On the Fly, a trout gets hooked on the lower Meduxnekeag River. Growing up on the banks of a good river is always great. But growing up in an area so full of fishing water is a dream come true; and a way of life here in Northern Maine. Right here in my local are we have so many streams and brooks that it almost seems unfair. It literally comes down to the fact that every flowing piece of water has Brookies in it. The lakes are also teaming with trout, salmon and all the warmer water species as well. But once you fish the flows with flies you are hooked. Last summer I took a trip to a brook of my childhood. Where as a kid I would catch a good 100 plus trout a summer. The limit at the time was 10 and ten trips or so was all it took to catch that many. But it usually took more. Not to mention there were so many other places to fish, why fish out a good brook? So we used to go all over and fish. In the days gone by I would fish Jimmy Brook with worms and spinners, but now it was forays with flies that had me. Gone were the days of the pretense that I was the great provider. No longer did I concern myself with being the best trout killer and angler in the neighborhood or school. All of it was replaced with this deep sense of preservation and conservation. The brook looked so much smaller than I had remembered. I couldn’t believe how long it had been since I went back in there. (A good 15 years or so.) The smells and sounds all came drifting back. As I walked the brook from outlet to headwaters, I found myself remembering the pools and overhangs of my youth. The trout were still there, in places with as little six or eight inches of water at best. Bruisers of 8 or 9 inches came up from somewhere in that ditch wide brook. Little guys of around 4 or 5 were more common, but nothing over 10 had ever been pulled from this brook. “Ditch-brookie” of about 10 inches. This was the kind of brook fishing most common up here. A lot of trout make it to the pan each year from these “small waters”. These are the places the locals’ fish to fill the larder, and add to the fiddleheads we love to eat. If you head out of the backwoods and venture either North or South to any of the hundred or so lakes and ponds around this area. 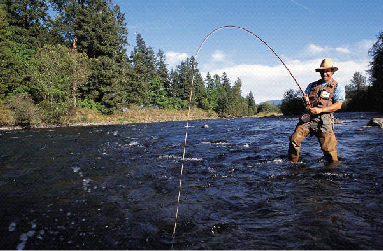 You can get back into the GLS mode and cast your fly in the traditional manner. Not to say the area rivers aren’t castable, but there aren’t that many. In comparison to the open water and banks of the area lakes and ponds. Lake fishing is traditionally trolling streamers on the fly rig. But I prefer to anchor and cast lighter wets and some dries to rising trout. Fishing the rise is a lot more productive. Just cruise the shoreline in a good canoe of 18 feet or so. The bays usually show a lot of bug activity in calm winds. As soon as the trout start, I cast out past the rise and strip it back. The “fleeing” fly seldom gets ignored. I suppose I should include some tech data here as well. Specifically about fly selection. Up here in Aroostook we have our own way of looking at the fly situation. We like a good mix of the traditional and the modern. The classic wets/dries and universal streamer patterns are used. What we look for here is the tried and true, “match-the-hatch”. Check the local fly shop and or “trading post”. If they are selling it, it most likely catches fish around here. Put aside the LL Bean fly guides and ask the locals. We use classic flies like the mosquito, the olive, and the stonefly series. But our best and most productive flies are peculiar to here. The deer hair “devilbug”, and the wingless “maplesyrup”. If you venture North of Bangor and want to experience fishing as it should be. Get a Delorme Atlas and a GPS. Pick a brook or stream and start wading. It will most likely lead you into a mess of branches and black flies. But it could lead you into a realm of wild trout and beaver dams. The key here is research on the ground not in a satellite map or topographic map. It will take you awhile to learn what to look for. But once you get it, you’ll find seclusion and bounty in these hidden Edens of trout. The fish are hard to get to, that is what protects them most. If you explore the wild brooks and streams, bring lots of bug dope and good waders with felt soles to combat the slippery rocks. Travel light and pack a lunch. It’s hard to fish with your stomach grumbling, and a heavy pack is unnecessary. If you head up here to the county check the local Chamber of Commerce site on the web and get a room booked in advance. The hotels/motels are few and far between. They also charge a lot more than you might expect. Bring good gear and you’ll have a lot of fun and catch many fish.